There are new methods for skin tightening other than a typical surgical face-lift - now new methods using Lasers, Lights, and Radio Waves, chemical peels, special cream formulates are being developed and tested and some are being used right now. Laser resurfacing is a very controlled burning procedure during which a laser vaporizes superficial layers of facial skin, removing not only wrinkles and lines caused by sun damage and facial expressions, but also acne scars, some folds and creases around the nose and mouth, and even pre cancerous and benign superficial growths. In a sense, the laser procedure creates a fresh surface over which new skin can grow. As people age, the effects of gravity, exposure to the sun, and the stresses of daily life can be seen in their faces. Deep creases form between the nose and mouth; the jaw line grows slack and jowly; folds and fat deposits appear around the neck. A face-lift (technically known as rhytidectomy) can't stop this aging process. What it can do is "set back the clock," improving the most visible signs of skin aging by removing excess fat, tightening underlying muscles, and re draping the skin of your face and neck. A face lift can be done alone, or in conjunction with other procedures such as a forehead lift, eyelid cosmetic surgery, or nose reshaping. Another skin beauty issue which can also be successfully treated is commonly known as crows feet wrinkles. If you're considering a face-lift, this web site can give you a basic understanding of the skin tightening procedure, when it can help, how it's performed, and what results you can expect. It can't answer all of your questions, since a lot depends on the individual patient and the surgeon. Please ask your surgeon about anything you don't understand. The best candidate for a face lift are men or females whose face and neck have begun to sag, but whose skin still has some elasticity and whose bone structure is strong and well-defined. Most patients are in their forties to sixties, but face-lifts can be done successfully on people in their seventies or eighties as well. A face-lift can make you look younger and fresher, and it may enhance your self-confidence in the process. But it can't give you a totally different look, nor can it restore the health and vitality of your youth. Before you decide to have surgery, think carefully about your expectations and discuss them with your surgeon. When a face-lift is performed by a qualified plastic surgeon, complications are infrequent and usually minor. Still, individuals vary greatly in their anatomy, their physical reactions, and their healing abilities, and the outcome is never completely predictable. Face lifts are very individualized procedures. In your initial consultation the surgeon will evaluate your face, including the skin and underlying bone, and discuss your goals for the surgery. If you decide to have a face lift, your surgeon will explain the techniques and anesthesia he or she will use, the type of facility where the surgery will be performed, and the risks and costs involved. Don't hesitate to ask your doctor any questions you may have, especially those regarding your expectations and concerns about the results. Whether your face lift is being done on an outpatient or inpatient basis, you should arrange for someone to drive you home after your surgery, and to help you out for a day or two if needed. A face lift may be performed in a surgeon's office-based facility, an outpatient surgery center, or a hospital. It's usually done on an outpatient basis, but some surgeons may hospitalize patients for a day when using general anesthesia. Certain conditions such as diabetes, including diabetic neuropathy, or high blood pressure should be monitored after surgery, and may also require a short inpatient stay. A face-lift usually takes several hours-or somewhat longer if you're having more than one procedure done. For extensive procedures, some surgeons may schedule two separate sessions. Every cosmetic surgeon approaches the procedure in his or her own way. Some complete one side of the face at a time, and others move back and forth between the sides. 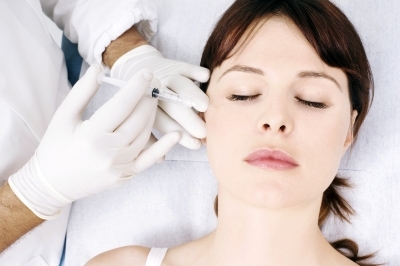 The exact placement of incisions and the sequence of events depends on your facial structure and your surgeon's technique. In general, the surgeon separates the skin from the fat and muscle below. Fat may be trimmed or suctioned from around the neck and chin to improve the contour. The surgeon then tightens the underlying muscle and membrane, pulls the skin back, and removes excess skin. Stitches secure the layers of tissue and close the incisions; metal clips may be used on the scalp. There isn't usually significant discomfort after skin tightening surgery; if there is, it can be lessened with the pain medication prescribed by your surgeon. However, severe or persistent pain or a sudden swelling of your face should be reported to your surgeon immediately. Some numbness of the skin is quite normal; it normally disappears in a few weeks or months. At the beginning, your face may look and feel rather strange. Your features may be distorted from the swelling, your facial movements may be slightly stiff and you'll probably be self-conscious about your skin and scars. Some bruising may persist for two or three weeks, and you may tire easily. It's not surprising that some skin treatment patients are disappointed and depressed at first. By the third week, you'll look and feel much better. Most patients are back at work about 10-days to 2-weeks after skin tightening surgery. If you need it, special camouflage makeup you can buy at a facial supplies store can mask most bruising. The chances are excellent that you'll be happy with your face lift - especially if you realize that the results may not be immediately apparent. Even after the swelling and bruises are gone, the hair around your temples may be thin and your skin may feel dry and rough for several months. Men may find they have to shave in new places-behind the neck and ears-where areas of beard- growing skin have been repositioned. You'll have some scars from your face lift, but they're usually hidden by your hair or in the natural creases of your face and ears. In any case, they'll fade within time and should be scarcely visible. Having a face-lift doesn't stop the clock. Your face will continue to age, and you may want to repeat the procedure one or more times perhaps five to ten years down the line. But in another sense, the effects of even one skin-tightening or face lift are lasting; years later, you'll continue to look better and younger than if you'd never had a face-lift at all. Face lift Surgery - Usually can get around independently by the day-2. Usually do not feel comfortable going out in public for 5-7 days. Requires 10-14 days before returning to your job, especially if your work is in the public view.